If you would like to “Adopt A Room” at Well House, or volunteer in another way – click here! Click HERE to get involved with the Vision to End Homelessness! On August 9th and 10th, Lowe’s Heroes “adopted” two rooms in the Well House community, a permanent housing program for previously homeless persons and an aspiring eco-village in southeast Grand Rapids. For this project, the ten year old volunteer program “Lowes Heroes” teamed up with Mustard Seed Ministries, whose local work focuses on home repairs for folks in need. 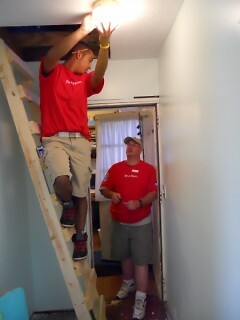 Together, the team gave two bedrooms fresh paint, energy efficient CFL lightbulbs, and new window treatments; they also fixed an old ladder to a loft space. In addition, Lowes donated and installed two cabinets and a large armoire to help give new residents a permanent place for their belongings. Well House relies on donations from the larger community in order to keep its doors open, and extends much appreciation Lowe’s store owners and employees for this generous service work. It is part of the forward momentum that was sparked by the Steelcase Design Team's pro-bono project last spring. Disclosure: Teresa Zbiciak is a VISTA at the Volunteer Center at Heart of West Michigan United Way and a friend of the folks at Well House.